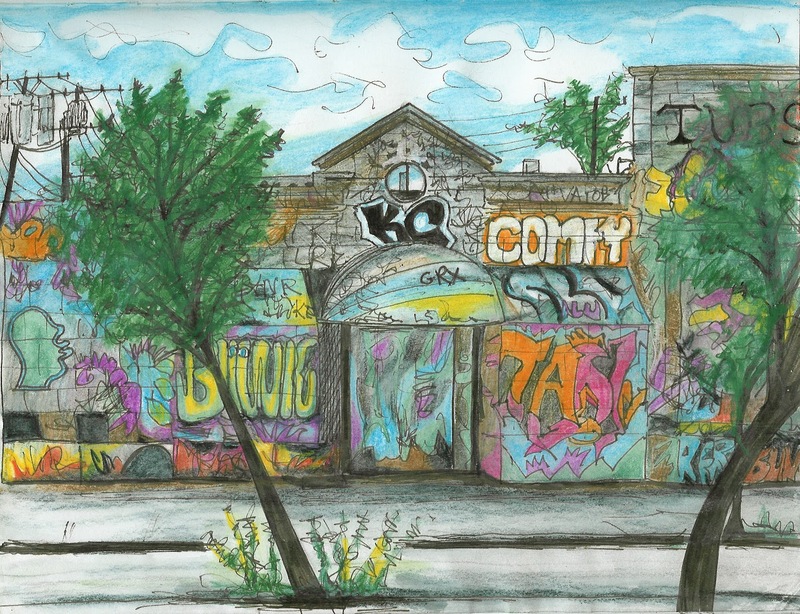 This is a repost of a sketch I did in 2010 as a tribute to the old TUBS building that has officially been demolished:( I just drove by the 50th & Roosevelt where the old Tubs building stood since the 1980s. I have fond memories of this building because I used to live behind the library across the street in the early '80s and was a frequent visitor of the Tubs establishment in it's heyday when the bubbles were flowing over and you got your own fluffy robe and carrot juice delivered to your private door. I've known this day would come, but I was hoping to have another chance to sketch it before demolition day. Alas, life and work took over and I did not make it back in time. I know other Seattle Sketchers captured the building on different days with different graffiti ... I saw Tina's recent post and am glad Gabi was able to do a series of sketches featured in the Seattle Times awhile back. Any other sketches of the Tubs building? I would love to see any sketches others have done. This sad day deserves a TUBS Sketcher tribute. Nice story, Jackie. Makes me feel almost wistful. I drove by TUBS last year, seeing it still covered in graffiti made me think of Five Pointz in Queens, NY, also a magnet for graffiti, which was just torn down. Great sketch and post, Jackie. Like you, I knew it would happen some day, but. . .
You really captured it with the color and it has a spray paint type of feeling great capture of Urban history!